Don’t let your toes curl up from the cold any longer. 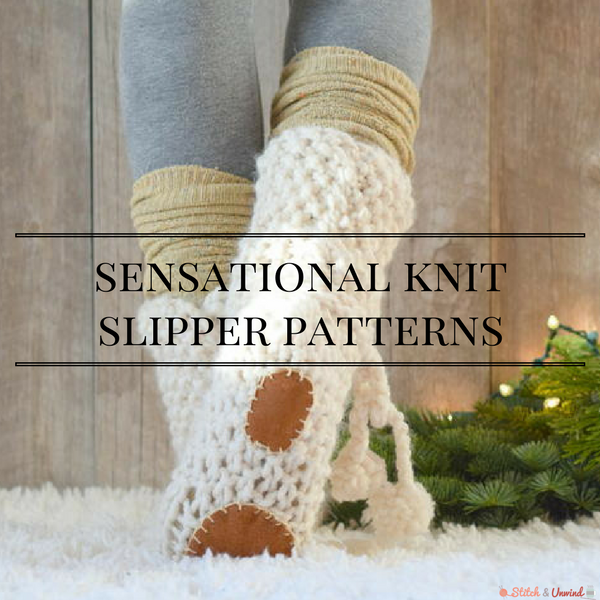 Work up one of these 14 Sensational Knit Slipper Patterns and keep your feet warm and cozy all year long. It doesn’t matter whether you’re a beginner knitter, an advanced knitter, or somewhere in between. We have something for everyone, so you can complete one of these patterns and feel a sense of accomplishment wash over you. Knit slippers also make wonderful handmade presents  for loved ones. Plus, once the holidays roll around, everyone loves to receive a pair of fuzzy knitted slippers  in their stocking. Nothing beats the feeling of curling up on the couch in your comfiest clothing and accessories and enjoying a lazy day at home. Personally, my feet are always cold, so you will find me wearing socks or slippers throughout the year. It might be hot and sunny outside, but once I sit in an air conditioned room for an extended period of time, I’m always reaching for something warm and soft to put on my feet. I would love to receive one of these free slipper knitting patterns  as a gift. I certainly know they would be put to good use! If you or someone you know can’t resist a beautiful pair of knit slippers, check out the list below and find your favorite pattern. Also, don’t forget to subscribe to Knit Picky Patterns , the free email newsletter from AllFreeKnitting.com , and receive hundreds of free knitting patterns in your inbox each week! Check out the list below to find our most popular knit slipper patterns . These beauties have been knitter tested and knitter approved, so you truly have nothing to lose. Find the one that speaks to you, grab your yarn and needles, find a comfy spot on the sofa, and get started! There are so many wonderful benefits of free slipper knitting patterns . In fact, you really can’t go wrong with any of the choices listed above. There is really something for everyone – from adults to babies. Give one or more patterns a try and find out which is your favorite.